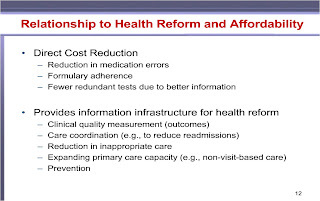 On Friday June 26, HHS Secretary Kathleen Sebelius made the local case for health reform, issuing one page compendiums of statistics on health care cost and quality for each of the fifty states. Percent increase in family premiums since 2000 (typically more than 85%). Costs of care for the uninsured. 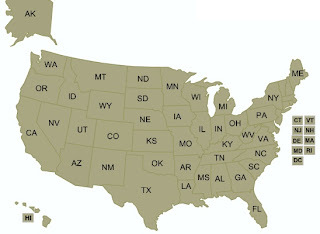 Percentage of state residents without insurance. 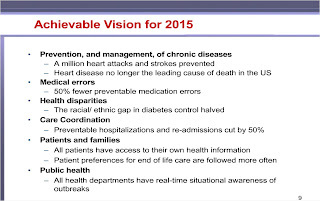 The state reports are published at healthreform.gov. 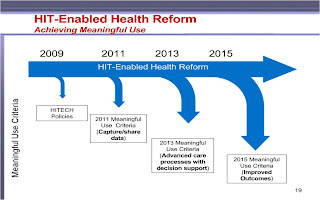 On June 18, the Certification Commission for Health Information Technology (CCHIT) announced that it is extending its certification options in response to concerns from open source developers and in an effort to better position itself to vie for appointment as the certification agency required under the HITECH provisions of the American Recovery and Reinvestment Act (ARRA). 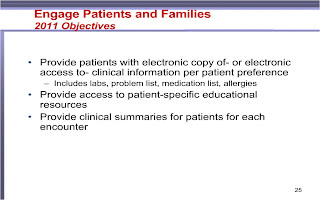 A new, modular certification program for electronic prescribing, personal health records, registries, and other technologies. 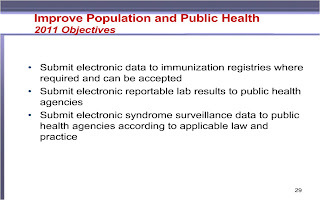 Focusing on basic compliance with Federal standards and security, the EHR-M program would be offered at lower cost, and could accommodate a wide variety of specialties, settings, and technologies. 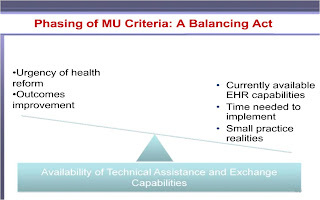 It would appeal to providers who prefer to combine technologies from multiple certified sources. 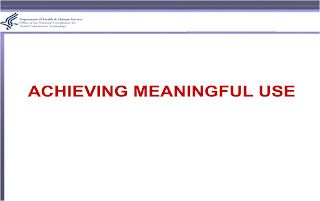 A simplified, low cost site-level certification. 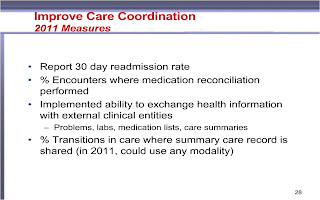 This program would enable providers who self-develop or assemble EHRs from noncertified sources to also qualify for the ARRA incentives." 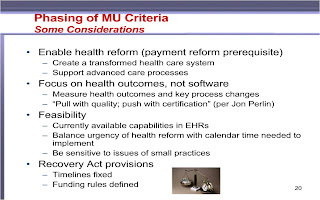 These certification options are targeted to be available for 2011-2012 certifications which kick off in January 2010. 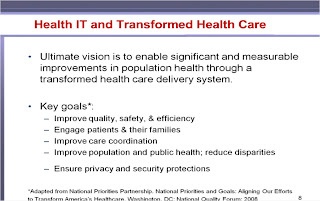 CCHIT has been criticized for too close a relationship to Health IT vendors, led most visibly by David Kibbe and Brian Klepper, who have asked "If the HITECH monies are spent on CCHIT certified EHRs that can't do any of these patient-centered tasks, or EHRs that don't come equipped with the features and functions to extend health IT capability to the patients and consumers, do we really think that the money will have been spent wisely? But that's the pathway we seem headed down, led by the vendors." Mark Leavitt, Chair of CCHIT, has responded forcefully to this criticism. 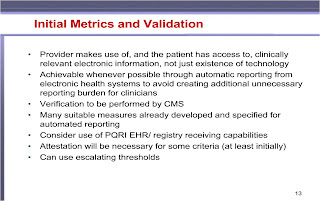 CCHIT's announcement addresses the concern that certification was previously only available to vendors able to deliver monolithic solutions covering all EHR requirements. 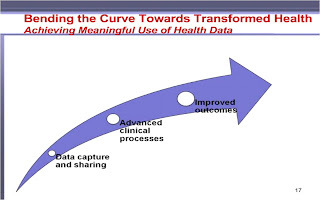 The Office of the National Coordinator for Health Information Technology (ONC) has announced the agenda for the June 29-30 open source CONNECT Seminar '09 in Washington D.C. 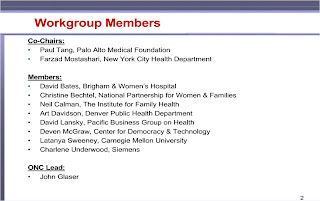 Speakers at the CONNECT Seminar '09 include keynoters ONC head David Blumenthal and CTO Aneesh Chopra, with business and technical tracks delivered by experts on the CONNECT system. 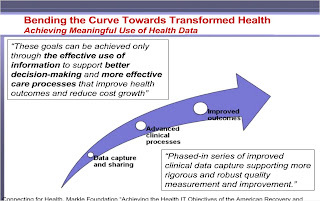 Guest author John Halamka reports on the first meeting of the clinical quality workgroup with their mission to provide recommendations on quality measures that should be tied to meaningful use. 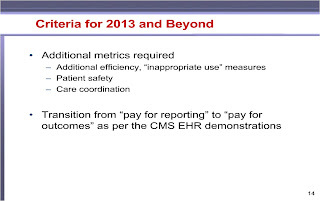 The workgroup expects to receive guidance on meaningful use from the HIT Policy Committee on June 16. Today, the HIT Standards Committee Clinical Quality Workgroup met for the first time to discuss our charge, our deliverables, and our workplan. 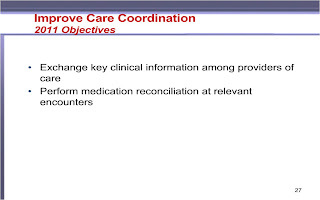 The broad charge to the workgroup is to make recommendations to the HIT Standards Committee on quality measures that should be included in the Meaningful Use definition and for future EHR requirements. 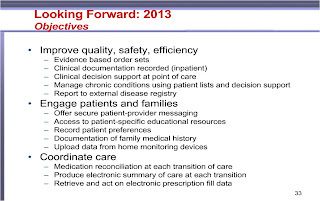 Also to make recommendations to the HIT Standards Committee on requirements for standards, implementation specifications, and certification related to EHRs and clinical quality. 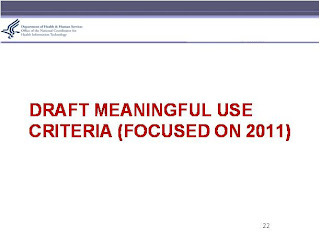 The specific charge is make recommendations to the HIT Standards Committee on specific quality measures that should be included in the definition of Meaningful Use for 2011 within two (2) months of the workgroup’s first meeting. The workgroup will also take into consideration the eight (8) areas listed in Section 3002(b)(2)(B) when developing recommendations for the committee. 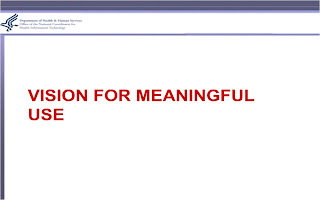 As I discussed in yesterday's blog, the HIT Policy Committee will discuss a matrix of meaningful use, standards, certification criteria, and meaningful use measures at their June 16th meeting. 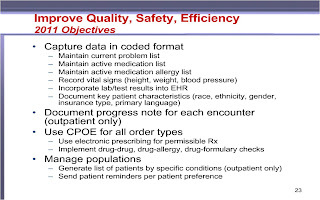 The Quality Workgroup will review this matrix and edit/amend it with appropriate accepted/recognized standards over the next 60 days. 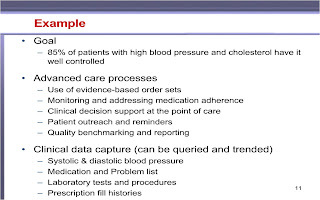 For Quality measures, the important work to date includes HITEP I, HITEP II, and HITSP's efforts to create services with the capbilities to exchange raw data and computed measures. 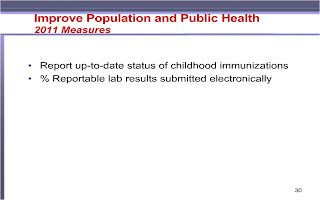 NQF released the draft of HITEP II's work for public comment yesterday. 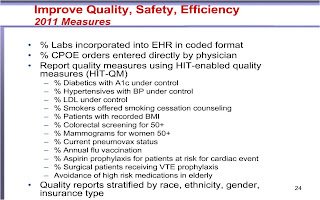 It includes an important framework for describing quality measures based on EHR data types. 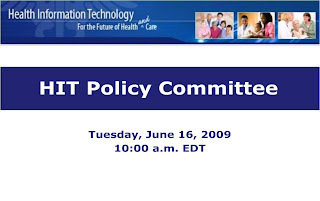 On June 16th, the Quality workgroup will receive meaningful use guidance from the HIT Policy Committee. 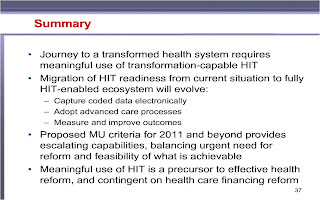 We'll work hard over the following week and will present our strawman standards, implementation guidance, and certification criteria at the June 23rd public meeting of the HIT Standards Workgroup. We'll continue to refine the matrix in July and complete our work in August. 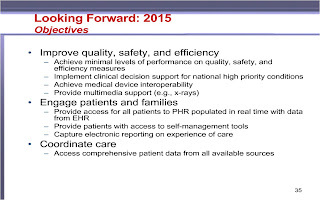 As I said yesterday, it's going to be a fun summer for everyone in healthcare IT!